Around 1900, the average life expectancy in the United States was just over 47 years. Anyone marking a 100th birthday was truly unusual and multiple newspapers celebrated centenarians—almost always women—in Cincinnati. But how many birthdays did they actually achieve? Mahala Moore told the Cincinnati Enquirer in 1896 that she was 116 years old and had been born during the Revolutionary War. She endured 85 years as a slave. Mrs. Moore’s mother was a slave, and she was born into slavery. When she was 15 years old, her master’s daughter married and Mrs. Moore was sold at auction to finance a dowry. At the same sale, her mother was sold along with several other slaves and she never heard from her again. A man named Jim Jackson, famous for raising horses, purchased Mrs. Moore, and he took her to his Alabama plantation, known as Forks of Cypress. She worked in the fields for the next 47 years, bearing 17 children. With one exception—her youngest daughter—all of her children were sold right out of her life. When her remaining daughter was sold to a Nashville buyer, Mrs. Moore accompanied her to Tennessee. They were living there at the end of the Civil War. Newly freed, they found work in a hospital for $10 a month. Around 1875, they relocated to Cincinnati, where the daughter died. Although elderly and alone, Mrs. Moore remained active. She voted in the school board election of 1897, when that was the only ballot allowed to women voters, and she testified in a 1900 court case. She was a stalwart in the Women’s Relief Corps, the auxiliary of the Civil War veteran organization, and attended that group’s national convention in Washington, DC, in 1898 when she says she was 118 years old. She is recorded in the 1900 Census as being 120 years of age. Mahala Moore is buried in Union Baptist Cemetery in Covedale. Mahala Moore had some company. In 1898, the Cincinnati Post recorded the death of “Aunt Nancy” Freeman at the age of 108. Once a slave, she had remained in the employ of the Millikins, her former owners, after emancipation and compiled a record of service exceeding 75 years. Although the Millikin family told the newspapers they would see to her burial expenses, Aunt Nancy was interred like a pauper on the grounds of the city infirmary. Roughly contemporaneous with Mahala Moore was another former slave named Annie Ray, also known as “Granny” Ray, who was born in North Carolina sometime between 1780 and 1793. In 1895, she recalled being owned by six different men, one of whom brought her to Tennessee. There she witnessed the 1806 duel between Andrew Jackson and Charles Dickinson, who had accused the future president of cheating on a horse race bet and insulting Jackson’s wife. Mrs. Ray told visitors that she also remembered the Battle of New Orleans. According to the newspapers, Granny Ray had 12 children, 105 grandchildren and the total number of her descendants, including great—great—grandchildren was more than one thousand. She told the census taker in 1870 that she was 90. Ten years later, she is recorded as being 87. At her death in 1900, the newspapers said she was 114. Was she as old as she claimed? It is difficult to answer such a question, given the abysmal documentation of African American citizens at this time. In addition, it is obvious that newspapers added a few years (or more) to any elderly woman’s story if it made for a better headline. 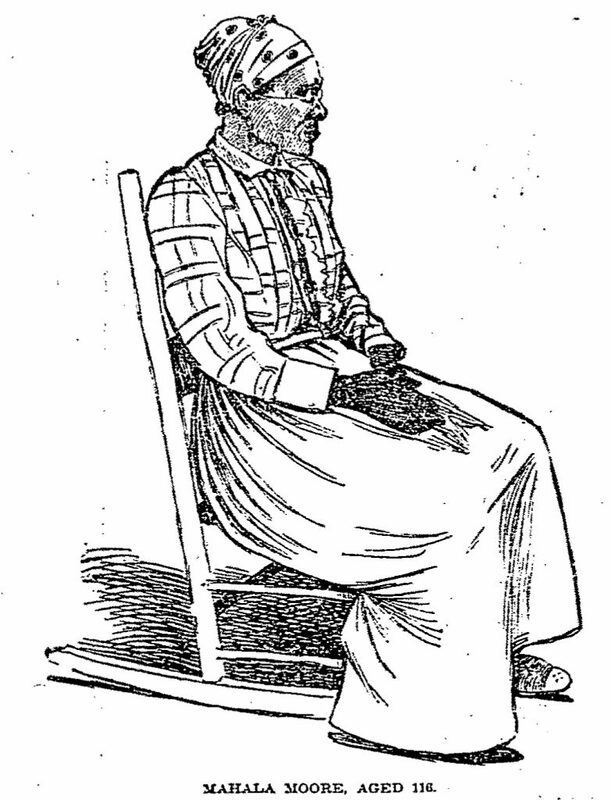 Take Salina Holloway, who died in Cincinnati at the purported age of 106 in 1893. The Cincinnati Post presented her life story with a list of living children aged 75, 60, 58, and 45. Doing the math, Mrs. Holloway would have given birth to these children at 31, 46, 48, and 61 years of age. That last birth, especially, would surely have made medical history. It appears a grain of salt is called for. In the example of Aunt Nancy Freeman, cited above, the newspaper had her dying at 108 years of age. Her official death certificate shows 96 years, still exceptional for that era, but shy of the century mark.